In December, Jesse, Chanel (our pup) and I headed to Verve Portraits for a portrait experience - and what an experience it was! Our photographer, Cam, was incredible and captured the most amazing images. We are so so glad that we can give you the chance to win the same experience as we're giving away FOUR Verve Portraits Prize Packs. Verve Portraits have studios in Sydney, Brisbane and Melbourne so it's important that you can get to a studio in either location (see list of locations here). Step two: Leave a comment on the entry post on Facebook telling us Who do you want to capture special memories with through a Verve Experience and why? - it could be your kids, your partner, your pets, your Mum - anyone! Step three: Let us know where you live (Sydney/Melbourne etc) so we can make sure there's a studio near you! 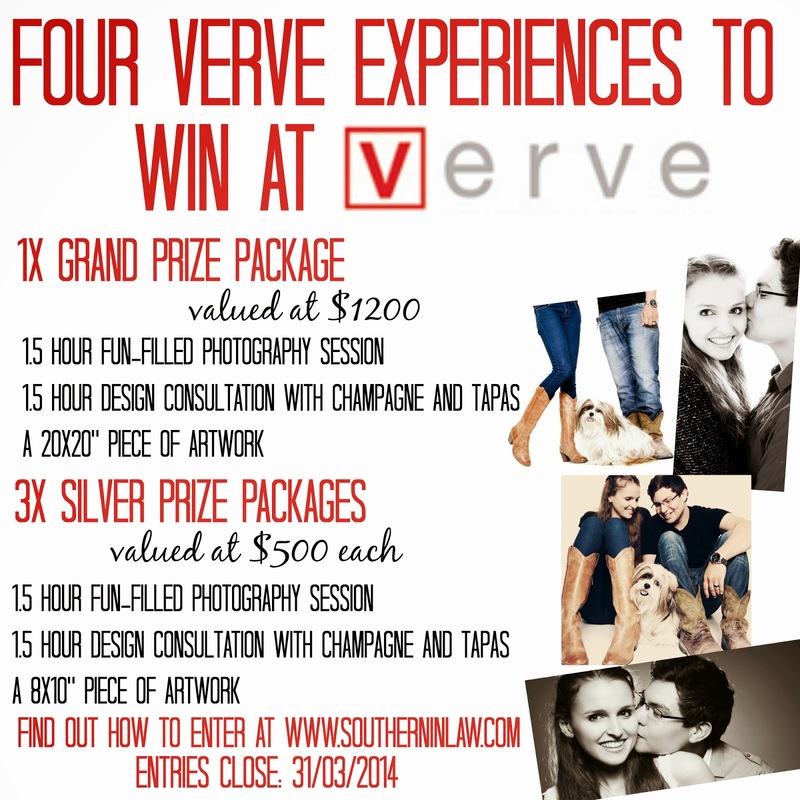 Competition is open to Australian Residents who can redeem a Verve Portraits experience at their closest Verve Studios Location and closes on March 31st 2014 at 11:59 PM EST. The best valid entries will be selected as the winner by Kristy, Jesse and Westfield and notified via Facebook. Should the winner not reply within 14 days of contact, an alternate winner will be selected. Please note: the winner must be a valid and current liker of the Southern In-Law Facebook page or other relevant social media pages at the time of competition's close.